Constitution Proposals & V2025: A Double Deception? A couple of weeks ago, the Prime Minister, Ranil Wickremesinghe, tabled in the Parliament the recommendations of the steering committee on constitutional reforms. Prior to that six committee reports were tabled. It is good that all these documents in all three languages are now available in the web so that people who are interested in the subject can consult them. This article by any means does aim at a comprehensive analysis of these reports although such an effort would be extremely important as these documents would be the basis of the future supreme law of the island. So far the discussion has revolved round two issues, namely. (1) is this a unitary or federal constitution? and (2) will the changes introduced into the Article 9 of the present constitution water down the constitutional status of the Buddhism? The subject that I intend to discuss in this article is of course linked with the first issue. However, the level and degree of devolution, does not affect directly the basic argument of the present article. Here, my intention is to examine the nexus between devolution and development. First, I shall discuss, at somewhat abstract level, the impact of devolved state structure on economic development. In the second part of the article, the relevant constitutional proposals would be examined in relation to the government economic perspective document, V2025 that was released sometime back at a big ceremony at the BMICH. I should emphasize my definition of economic development closely follows Dudley Sears’s well-known definition of development. It includes (1) a reasonable rate of growth; and (2) the reduction of poverty, unemployment and inequality from its existing levels. I would add to the list a third element, the maintenance of ecological balance at a reasonable level. The additional fiscal burden emanating from new state structures may be compensated at least partly by increasing governmental revenue if the provincial states are more effective in revenue collection than the central administration is. Similarly, the provincial governments may be cost-effective in case of program implementation especially due to proximity factor. Secondly, it has been generally agreed that matters ought to be handled by the smallest, lowest or least centralized competent authority so that needs and aspirations of respective communities will receive due respect in decision-making. In other words, decisions should be taken at a local level if possible, rather than by a central authority. This principle of subsidiarity allows peoples’ direct engagement in decision-making on subjects that affects their life. Thus decision-making and responsibility go together. Thirdly, as VitoTanzi has argued, “a decentralized system can become a surrogate for competition, bringing to the public sector some of the allocative benefits that a competitive markets brings to the private sector”. Hence, It may have positive impact on economic development as people can compare different economic policies adopted by respective local administration. Finally, Decentralized/ devolved / federal state structure would help reducing regional economic disparities by minimizing center and urban bias in economic decision-making. 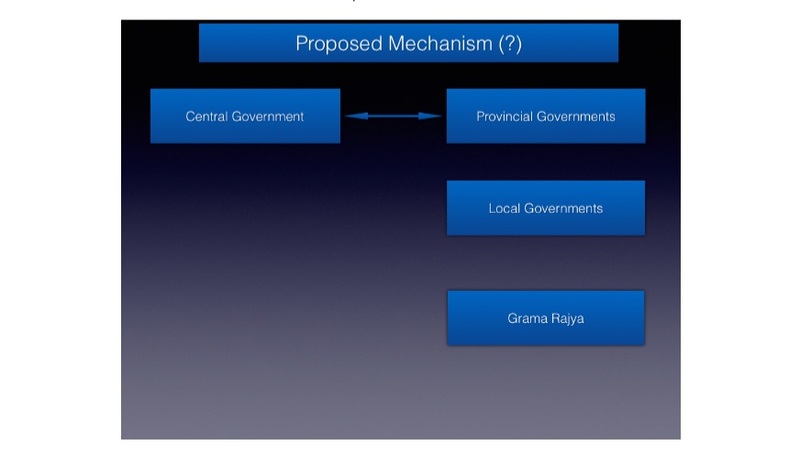 However, to what extent these four principles would impact on economic development has to be examined by either analyzing the performance of the existing provincial council system or looking at the place and importance given to the proposed state structures in the new economic plan. This requires not abstract theorizing but the concrete analysis of the concrete situation. Recently the Sirisena-Wickremesinghe government has released its V2025 document that outlines how the government proposes to manage the Sri Lankan economy in the next 8 years (2018- 2015). It is interesting to note that this is the fourth economic perspective document in the last 32 months period. Similarly the Prime Minister has tabled Steering Committee proposals on the new constitution. The proposed state structure in the new constitution would appear as in Figure 1. It appears there would be four or three tier state structure. We will introduce supportive legal reforms. In particular the new Inland Revenue Act, Foreign Exchange Act, Voluntary Disclosures of Income Act, State Land Bank Act, Anti Dumping Act, State Commercial Enterprises Act, Ports and Airports Act, Ruhunu Economic Development Corporation Act, Lands (Special Provisions) Act, Sustainable Development Act, Liability Management Act, and National Debt Office Act will considerably improve the business-friendly environment. No reference to the proposed state structure or how it would become a part of the “new approach to growth”. Once again Chapter 6 of the V2025 that entitles “strengthening the growth framework” does not have a reference as to how the intergovernmental relations would be a part of this framework. The irony is it discusses private-public partnership but not the center-provincial partnership. In Chapter 7 we find the following statement. “The Government will establish major economic development zones such as Ruhuna & Wayamba and mega projects of urban development. Megapolis project”. It is very clear that there no linkage between these mega projects and the provincial councils. In other words the same mechanism that existed under the last regime in which center plays the the sole and critical role will remain unchanged. The words using Ruhuna & Wayamba make it clear that the people who drafted V2025 did not have any idea about the constitutional proposals. “We will implement the Grama Rajya (GR) concept. GR is our proposal to address gaps in people’s participation in Government and development. GR will enable local communities to become stakeholders in the development of their community, and integrate local projects with mainstream development agendas. The main objectives of GR centre around the socioeconomic and cultural development of localities, social well-being, shared ownership of social economic goods, and alignment of local development with national development goals. GR will create a space in which people participation in Local Government can function within the country’s larger macroeconomic framework. – We will create 2,500 units across Sri Lanka to operationalise GR. The creation of these units will consider factors such as economic convergence and viability, social cohesion, geographical layout, for the purpose of creating a citizen-demand driven mechanism. Besides this inconsistency between the economic plan and the proposed economic structure it can be said that V2025 is a weak document based on totally unrealistic foundation and flawed theoretical framework. However, what is equally clear is it fails to understand the nexus between the state structure and the economic plan. This shows either total ignorance in the part of policy makers or their objectives to deceive people of all communities with broken promises. This is the text of the talk delivered at the seminar organized by the Bar Association of Sri Lanka in Polonnaruwa and Matale on October 7 and 8. Realizing Muslim Women's Rights - When Is The Right Time? Read the area, no of provincial or state govts, no of politicians per govt, and no of federal politicians or Senators for USA. NEw york: area 55.000 sq. miles, 27 state politicians and two federal politicians. the president has cabinet ministers aka Secretaries all of whom are professionals. See Sri lanka Ranil di dnot do anything he said this time. Instead he emptied the central bank, and almost bankrupted the EPF and state banks. Besides, it is not published, they sold part of a private bank (commercial bank) to a foreigner. No one sells banks to foerigners because, they can manipulate currency and bankrupt the currency. Ranil’s plan is to become Executive prime minister. Why a people selected executive president is bad over the parliament elected – executive prime minister ?. Praja sabha is constitutional council. they will create one for north and one for east etc., PRaja sabha is CATALONIC coming to Sri lanka. Sri lanka becoming a KERALA. HIndu majority is sidelined and christiand and muslims run the state. BTW. Sri lanka is 25,000 sq. miles and ten govts. who is going tio pay for all. those women who are working in the middle east ?. Saudi arabia has already started austerity measures. So the remittances will only go down and not up. The question even the presstitutes not talking is, HORAPALANAYA govt removed wijedasa Rajapakse saying he is not prosecuting Rajapakses. NEw female minister who di dnot do anything for overseas employed womenis silent now. 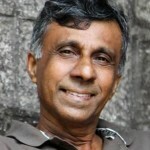 instead of Rajapakse prosecuting another dishinest Rajapakse BASIL is promoting UNP in the NOrht and East. Why Central bank theft is covered now. no one is arrested. Instead, Ranil goes for a foreign trip. MY3 goes to an indian KOVIL with the whole family. MY3 whole families toured New york too. IS he scared of something. one after the other overseas trips by the whole family. In between only event was, he reenacted Mahinda Rajapakse’s paddy field preparation nadagama. How he is going to agriculturally develop the country MY3 himself built tube wells and wells are dried now. He thinks whole sri lanka is dry and imports rice. The article says ~ “…………As a well known public finance economist, Prof Ursula Hicks had pointed out ‘a single unitary constitution would almost certainly be cheaper to run’……..”. Unitary constitution (whatever it is) has not worked in Lanka for 70 years and has reached the use-by date. We were told that the treacherous Tamils caused this mal-function. Finally the truth has emerged- It is the competition between two groups from the majority community. It is no longer “cheaper to run”. Bribes are getting bigger and bigger. It has become necessary to tweek the unitary system. Both players say that a federal form of governance will lead to separation. This mindset comes off competition not out of conviction. It is not the UNitary govt, it is bankrupt southern politicians, particularly SWRD who screwed up the country. Otherwise, there was no Tamil national language in the country. there were only about 10% of tamils to serve 90% of sinhale people. Every thing began after SWRD with the help of LSSP. those things should be reversed back. Why Ranil Wicramasinghe is this dumb. Just like a few cultivations officers, aka UNP organizers for each electorate, that a former UNP,,,, Ranil is starting so many Gama Rajaya sabhas. why doe snot he asks them to be self sufficient by asking them to tax the what ever the area. Why Ranil is deoending on the women in the middle east to fund all his stupid plans. I think a grade 10 kid would better than him. Sri lankan political syatem is an unbelievable disaster and a wastage of money. the greater toronto area isthe area of 2200 Sq. miles (or 899 sq. KM) approximately, has five municiplities some of which are just rural municipalities. population is 6 million. NPC in Sri lanka 14 sq. KM and is a govt which has 38 politicians. Calculate how do they earn their salaries,perks and benefits if they are self sustaining and tax the public. It would be definitely be bankrupt. See what Ranil is going to do. why the Public silent. Eventhe Sri lankan NGOs are bankrupt and they are just working for some one else’s money. Another bunch of thieves. where ever, I see, it is the same story. The Unitary and Federal will be at the two extremes of a continuum. it is true that underdeveloped regions will opt for more resources diverted to welfare and economy of scale compromised,but balance development is a favorable outcome that should be encouraged. Hence, It may have positive impact on economic development as people can compare different economic policies adopted by respective local administration. The so-called devolution of administration-rule by several regions divided into Provincial levels are aim at dismantle center authority of law of Sovereignty. The majority people power of democracy will be regain by regional bourgeois, that will be extensively exploitation and plundering of national wealth be unprecedented scale in the system of” Democratic -devolution”. People level of poverty become moving towards bad to worse by that time, New Petty bourgeoisies being rule of democracy administration tools be in more repressive state in center as well as regions! The range of political corruption expanded by unlimited scale center to regions by ruling Parties leaderships . There is no democratic accountability for the by elected resrestsntives of politicos and their ruling parties. This model of modern democracy and political classes ,parties and their leaders are NO Responsibility and accountability what ever parties in terms of governances? Indeed the corruptions frauds and scandals that the key role democracy; what ever the party being to political-power . In fact political classes are granted by unknown voters ,the very reasons is that ignorance of the citizens after being to the helm of authority rules, then the votes are powerless and voiceless result of that democracy confined to few-rich and companies CEOs. 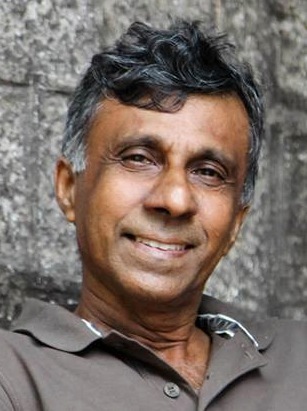 MS, Ranil Wicks and CBK on three-in -one that similar pattern of democracy proposed until 2025 to be completed without mandate? That is well organized system of Western Valued Democracy accepted by USA, UK, EU-countries of 27 nations , Canada ,Australia and Japan?